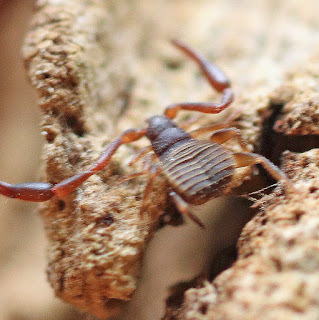 Peusdoscorpions, are a type of arachnid that superficially resemble true scorpions. 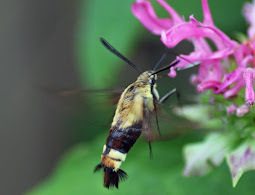 They lack the stinger and are much, much smaller at only 0.08-0.31 inches in length. Although there is a species, Garypus titanius that may reach lengths up to 1/2 inch. Large by pseudoscorpion standards to be sure. Body is flattened and pear-shaped and many people mistake them for ticks when they first spot them. In fact the one photographed here was discovered by my daughter when she was unwrapping a wedding gift. I heard her make a comment "oh look, we got a tick with this gift." 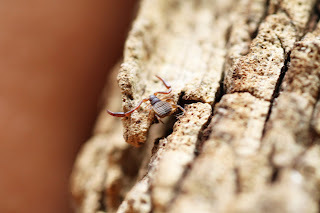 I looked and discovered it was not a tick, but a pseudoscorpion. The abdomen of pseudoscorpions have twelve segments and is made up of a protective substance called chitin. They are born looking very much like the adult and go through 3 instars, or molts, before reaching adult size. They may have 2, 4 or no eyes at all. Even those with eyes do not see well and do not rely on eyesight to find prey. Instead they use very sensitive hairs on their legs and pinchers. When a prey item brushes against them they are able to move quickly and grab dinner! Venom glands are located in the pincher-like claws that they use to inject venom into their prey. They are completely harmless unless you are booklice, mites, small flies, ants, or the larvae of carpet beetles and clothes moths. The venom works to dissolve the tissue of their insect prey so this little predator can slurp the insides out like a tiny insect slurpee. Because of their tiny size they are rarely seen by humans, but they may occasionally show up in homes where you are likely to find them in bathrooms, kitchens and laundry rooms. They seem to prefer moist areas and in the wild you will likely find them in woodlands hiding up leaf litter or wood piles. Being tiny and lacking wings can make it difficult to move from one location to another and to spread your genes around. They have conquered this potential problematic dilemma by hitchhiking on various beetles, and thus are carried from one location to another via the beetle buses they grab a seat on. All of the best travel options serve dinner and these beetles are no exception. Often covered in mites that can drain the beetle, the pseudoscorpion finds itself attached to a flying all-you-can-eat-buffet. This symbiotic relationship benefits both the beetle and the tiny hitchhiker. The beetle gets rid of the mites and the pseudoscorpion gets dinner and transportation. 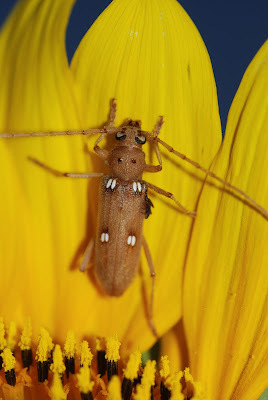 (Ivory Marked Beetle pictured has a pseudoscorpion attached to it). 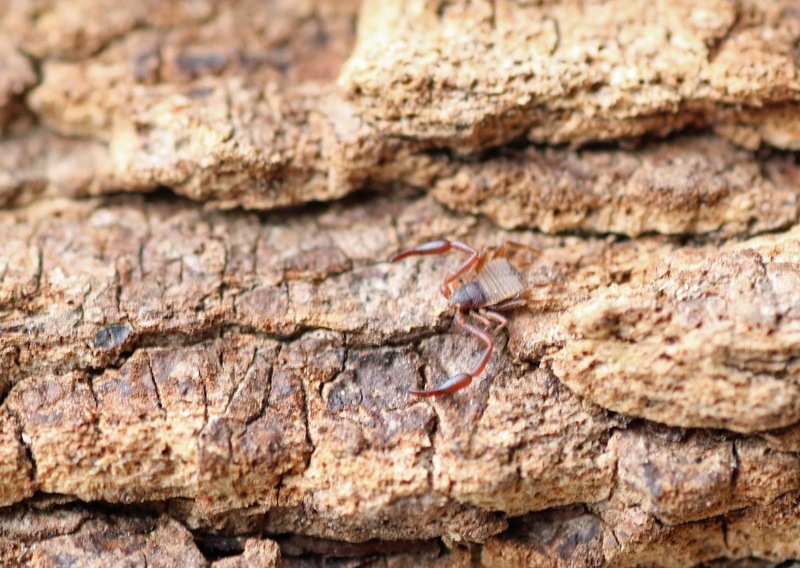 Some species of pseudoscorpions will even mate on these flights, giving a whole new perspective on the "mile high club." Males form a packet of sperm called a spermatophore that he deposits on the ground (or the back of a beetle), and then grabs the female with his pinchers and drags her across it so that she will take his sperm up inside her body. Other species push the sperm inside their mates. Females may mate with numerous partners and can retain the sperm of each. She will become impregnated when she is ready to reproduce. She can produce up to 40 offspring and will provide maternal care for them by carrying them on her back and washing them with her pinchers. 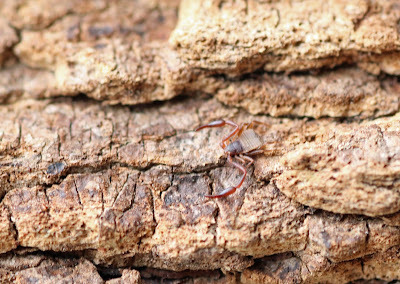 The first known fossils of pseudoscorpions date to 380 million years ago. Their body shape has changed very little since they first appeared. Aristotle was the first person known to have described them and most likely encountered them in the vast amount of papers and books at his disposal They are sometimes referred to as Book Scorpions because they are often found in books and piles of paper where they are feeding on booklice. They are completely harmless to humans and cannot sting or bite us. Their habit of feeding on insects and tiny arachnids, like mites, that can cause significant damage makes them hugely beneficial to us. You will most likely never find more than one or two every once in awhile, but should you be encountering them in large numbers you may have a moisture problem or a large population of prey items they like to feed on. those issues should be addressed, rather than outwardly killing these tiny arachnids by using chemicals. 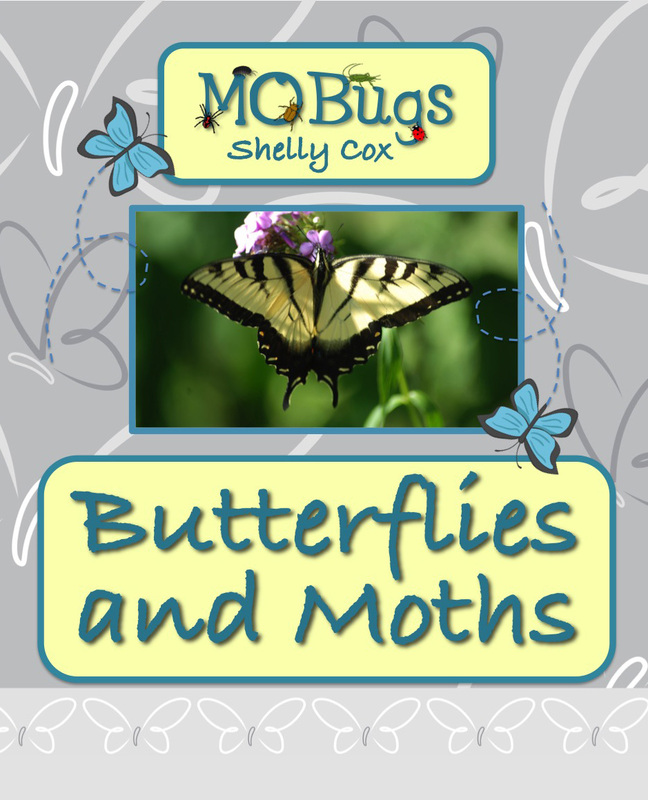 I recently wrote a childrens book about Butterflies and Moths. It is now available for purchase on Amazon. This a great way to introduce children to one of the most popular orders of insects, the Lepidoptera. There is also a section on vocabulary so they learn many scientific terms. Just click the image and it will take you directly to the purchasing page. Visit this collective resource for Nature Blogs of Eastern United States. Matt Smith has done a great job of compiling a wide variety of Blogs for all Nature Enthusiasts. He calls it a work in progress, but it is already fabulous! If you'd like your blog added to his line-up just visit the link here (click the image) and send him a request. I don't generally promote pest control companies to my blog, but I will certainly make an exception in this case. I've know the Cooperiders since I was a little girl. They run an honest, ethical company. They will help homeowners find alternatives to their pest problems when those alternatives exist. They are as much a lover of insects and spiders as I am and fully recognize their importance in the ecosystem. However, we all know occasionally pests show up in our homes that we cannot, nor should not share space with. Click the picture above, to visit their website and locate their contact info. 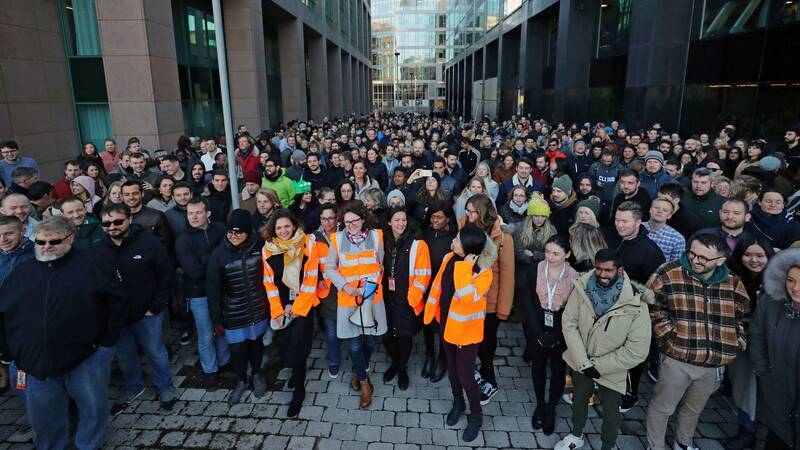 Googlers Claim Retaliation, Samsung Delays Fold, and More News - Catch up on the most important news today in 2 minutes or less. Bumperstickers for the Holidays! 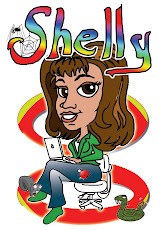 - The Bug Chicks - A site for parents, teachers and bugdorks. Bumperstickers for the Holidays! Tufted titmouse (Baeolophus bicolor) - *Tufted titmouse (Baeolophus bicolor)* *Out in our first snow of the winter. Only about an inch of snowfall.* . I am proud to be chosen as part of this list of Entomology Blogs. There are some great blogs and websites with a focus on Insects and Spiders, and to be included among them is an honor indeed. 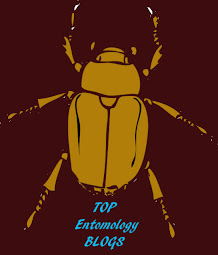 Click this link to check out more great entomology blog posts. Having trouble identifying the spider that just showed up in your house, or backyard? Let Eric and the other experts at Spider Identification help identify it. Most spiders are harmless to humans and provide a great service to us by eating untold amounts of insects. For some people though, the arachnophobia runs too deep. Ease your fears and learn about the spiders living around you. Needing a good all around field guide to Insects of North America? Let me recommend this awesome, comprehensive guide. It is full of wonderful full color photos making identification simple. It is easy enough to use to be beneficial to Children and Adults. This is my go-to guide when trying to identify all those unique insects that show up in my yard, or anywhere else. 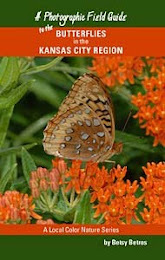 A friend of mine Betsy Betros has written a wonderful, full color field guide to Kansas City Butterflies. It is fast becoming my buttefly bible. 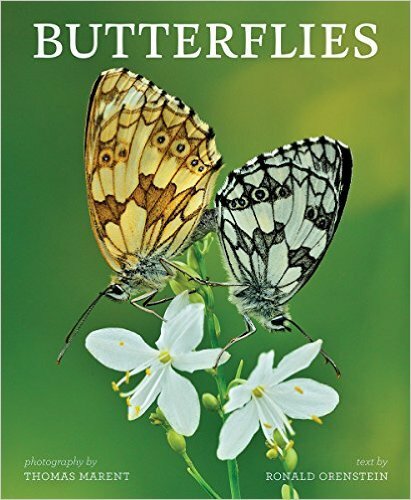 This book would be beneficial to anyone who loves butterflies and gardening. These butterflies will be found beyond Kansas City's borders. You won't be disappointed in this guide, I would consider it a must-have! Here are some of the most colorful, spectacular and sometimes weird examples of the world's butterflies and moths. From the common swallowtail to the iridescent blue morpho, Thomas Marent's stunning photographs provide a close-up view of the remarkable family of insects known as Lepidoptera. The macro photography complements the enlightening text written by zoologist Ronald Orenstein, who explains the scientific curiosities of these amazing insects. I feel honored to be included in the list of best blogs for 2010. Thank you so much for the shout out and the award Geek. You put a smile on my face! Recently one of my regular followers recommended me for the Best Blog Award. 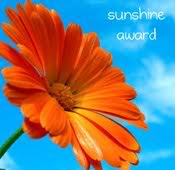 Thank you so much Paula, for believing that this blog was worthy of such an honor.